Amarnath Tour,Amarnath Yatra Tour,Amarnath Yatra Tour Package,Amarnath Travel Package,Amarnath Trekking. One of the holy Trinity, Shiva is a living God. the most sacred and the most ancient book of India, the Rigveda evokes his presence in its hymns. Vedic myths, rituals and even astronomy testify to his existence from the dawn of time. But Shiva, Destroyer, the mendicant, is undefinable : He is a great yogi. Legend has it that Shiva recounted to Parvati the secret of creation in a Cave in Amarnath. Unkown to them a pair of mating doves eavesdropped on this conversation and having learned the secret, are reborn again and again, and have made the cave their eternal abode. Many pilgrims report seeing the doves pair when they trek the ardous route to pay obeisance before the ice-lingam. Ye another legend has it that when Kashyap Rishi drined the Kashmir valley of water the cave and lingam were discovered by Bregeish Rishi who was travelling the Himalays. When people heard of lingam Amarnath for the became Shiva's abode and a centre of pilgrimage. Situated in a narrow gorge at the farther end of Lidder valley, Amarnath stands at 3888 mtrs and 46 Kms from Pahalgam and 141 Kms from Srinagar. Though the original pilgrimage subscribe that Yatra be undertaken from Srinagar , the more common practice is to begin journey from Chandanwari and cover the distance to Amarnath and back in 5 days. 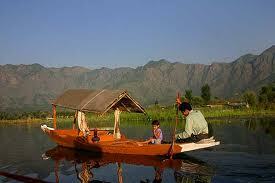 Pahalgam is 96 Kms from Srinagar. the trek from Chandanwari to Cave is on an ancient peregerine route. pilgrims camp at Pahalgam or Chandanwari on the first night out. with Sheshnag are recounted by campfires to the stillnes of pine scented Himalyan night. The second day 12 km trek steadily gains height winding across Mahagunas Pass at 4600 mtrs and then descendeing to the meadow land of Panchtarni the last camp enroute to Amarnath Cave. From Panchtarni to Amarnath the distance is 6kms and an early morning start is recommended for there is long queue awaitning entry at the cave. The same day devotees after darshans can return to Panchtarni in time for lunch and continue upto Sheshnag for night halt. For those who journey with faith it is a rewarding experience. 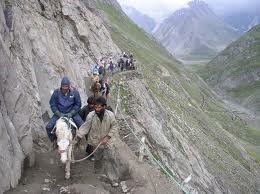 Baltal, 15 km from Sonamarg at an altitude of 2743 m , is the base camp of Amarnathji yatra . The meandering trek of 14 k from Baltal leads to the Holy Cave . You can easily return the same day by early evening to Baltal where ample tents are available at affordable cost. Panies and Danies from Baltal can also be hired at fixed government rates. Now operate Helicopter Services for Yatris from Baltal and Srinagar during the yatra period. 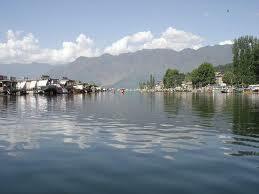 Sonamarg is situated on Srinagar-Leh road north east from Srinagar. 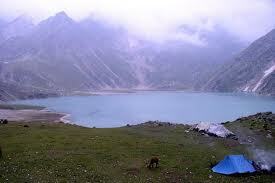 About 15 kms ahead lies Baltal which is charming little valley lying in the foothills of Zojila Pass. The holy cave is just a days journey from here. At domail 2 kms from Baltal free langar(community Kitchen) facility is available. The trek from here is very steep and therefore needs great caution and care. Some teastalls are available at Brarimarg and Sangam top. Several snow bridges on the fast flwing streams are to be crossed and during rains the road becomes slippery. At sangam top the road meets Pahalgam route. 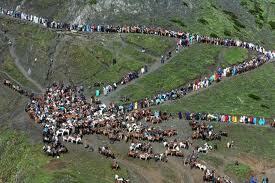 At Baltal Ponies/Dandies/Pack ponies /porters are available on Govt. approved rates. The nearest Airport is away in Badgam Distt. This Airport is connected with major cities of India. The nearest Rail Head is at Jammu which is 300 Kms away and from there National Highway NH1A connects the Kashmir valley with country.Every sort of transport to suit every budget from Buses to Taxis ply on this Highway. It Takes around 10 to 12 hours to cross this mountaineous road which crosses some beautiful spots andthe famous Jawahar Tunnel linking Kashmir Valley with country.